The following report was released by the United Nations Assistance Mission in Afghanistan on February 18, 2015. The intensification of conflict-related violence in Afghanistan took an extreme toll on civilians in 2014, with civilian loss of life and injury reaching unprecedented levels. UNAMA documented 10,548 civilian casualties (3,699 deaths and 6,849 injured), marking a 25 per cent increase in civilian deaths, a 21 per cent increase in injuries for an overall increase of 22 per cent in civilian casualties compared to 2013.2 In 2014, UNAMA documented the highest number of civilian deaths and injuries in a single year since it began systematically recording civilian casualties in 2009. 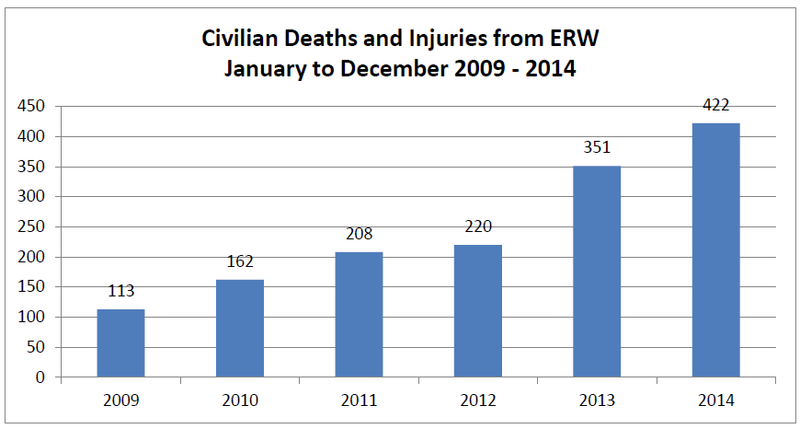 Between 1 January 2009 and 31 December 2014, UNAMA has documented 47,745 civilian casualties (17,774 killed and 29,971 injured). 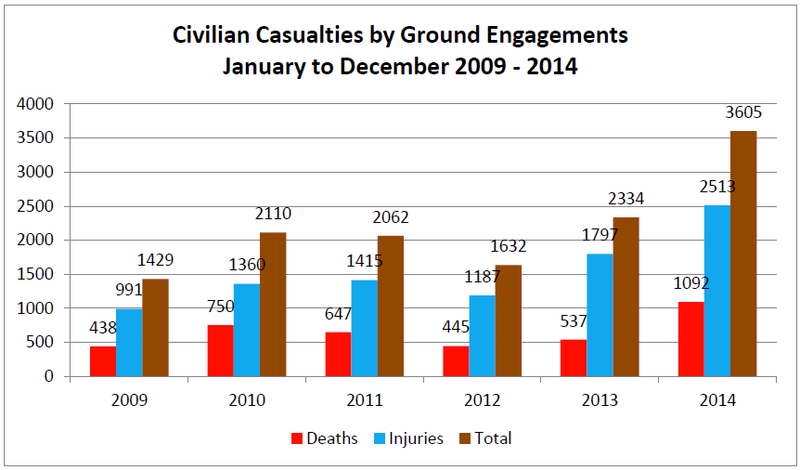 The 22 per cent rise in civilian casualties in 2014 resulted mainly from increased ground engagements across Afghanistan in which parties to the conflict also increasingly used high explosive weapons systems, such as mortars, rockets and grenades in civilian-populated areas – with devastating consequences for civilians. In 2014, civilian deaths and injuries from ground engagements increased by 54 per cent compared to 2013 making them the leading cause of civilian casualties and the biggest killers of women and children in 2014. UNAMA attributed 72 per cent of all civilian casualties to Anti-Government Elements, 14 per cent to Pro-Government Forces (12 per cent to Afghan national security forces, two per cent to international military forces) and 10 per cent to ground engagements between Anti-Government Elements and Afghan national security forces in which a civilian casualty could not be attributed to a specific party. UNAMA attributed three per cent of all civilian casualties to unattributed explosive remnants of war and the remaining one per cent to cross-border shelling from Pakistan into Afghanistan. In 2014, UNAMA recorded the highest number of women‟s deaths and injuries from conflict-related violence since 2009, when UNAMA began systematically documenting civilian casualties. Five hundred and fifty-six (556) incidents were recorded which caused 909 women casualties (298 deaths and 611 injured), a 21 per cent increase from 2013. To highlight the broader social and economic impact of the conflict on the lives of Afghan women, UNAMA interviewed 60 women from all regions in Afghanistan whose husbands, all civilians, were killed or seriously injured in conflict-related violence in 2014. UNAMA found that women who were left as sole income-providers for their households after the death or injury of their husbands experienced long-lasting social and economic consequences, with poverty forcing many women to give their daughters in marriage in exchange for debts or to take their children out of school often to work. Widowed women were often particularly vulnerable to other forms of violence and abuse from family and community members. These findings call for urgent action by the Government of Afghanistan to address the basic needs of this group of very vulnerable and often marginalized women and children. 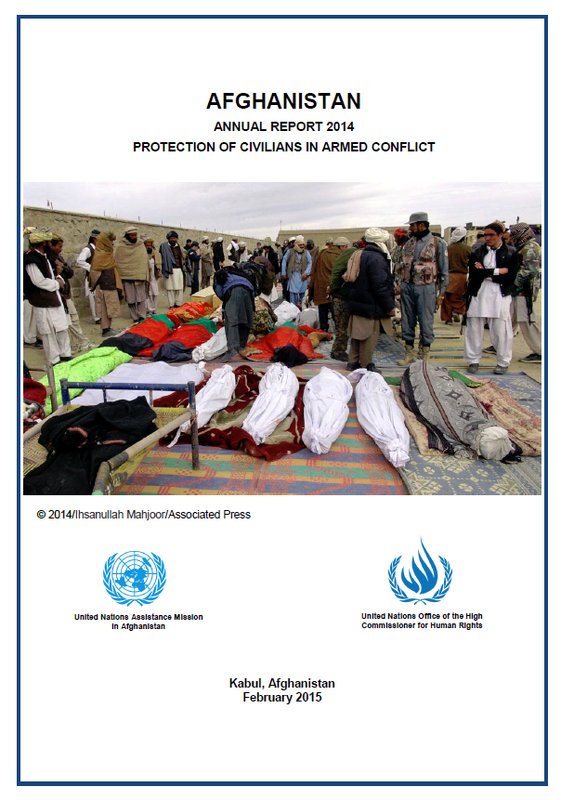 UNAMA documented unprecedented levels of conflict-related violence affecting Afghan children in 2014. A total of 1,065 incidents resulted in 2,474 children casualties (714 killed and 1,760 injured), with the highest number of children casualties recorded since 2009. In 2014, children casualties increased by 40 per cent compared to 2013. UNAMA continued to document a number of incidents of sexual violence against children by parties to the conflict. UNAMA observed a continuing climate of impunity for such crimes due to a lack of due diligence on the part of authorities to investigate, prosecute and punish offenders. While acknowledging significant under-reporting, UNAMA verified five incidents of conflict-related sexual violence against children, four perpetrated by ALP members and one by members of a Pro-Government armed group. As the withdrawal of international military forces and combat air support continued in 2014, UNAMA observed more frequent and larger ground operations by both Afghan national security forces and Anti-Government Elements notably in Helmand, Kunar and Faryab provinces with fighting often occurring near district centres. The increased ground fighting in civilian–populated areas with all parties using mortars, other explosive weapons and small arms fire often led to harmful consequences for civilians. UNAMA documented 3,605 civilian casualties (1,092 killed and 2,513 injured) from ground engagements, a 54 per cent increase from 2013, accounting for 34 per cent of all civilian casualties in 2014. These civilian deaths and injuries were caused when civilians were caught in crossfire between insurgents and Afghan security forces fighting in and around civilian-populated areas. Of the 3,605 civilian casualties from ground engagements, UNAMA attributed 43 per cent to Anti-Government Elements and 26 per cent to Pro-Government Forces. UNAMA could not attribute civilian deaths and injuries solely to either party in 29 per cent of ground engagements that caused civilian casualties. The remaining two per cent of civilian casualties from ground engagements were attributed to cross-border shelling.